Cherries are a wonderful ingredient to bake with when they’re in season, even though I admit that I sometimes have fewer fresh cherries on hand than I would like for baking, since I tend to snack on them when they’re in my kitchen. Fresh cherries are an excellent option for pies, muffins and other baked goods. When it comes to cookies, however, dried cherries are the way to go because you can bring in lots of cherry flavor without excess moisture that will compromise the texture of the cookies. These Lemon Cherry Sugar Cookies are inspired by cherry pie and are a great twist on a more traditional sugar cookie. 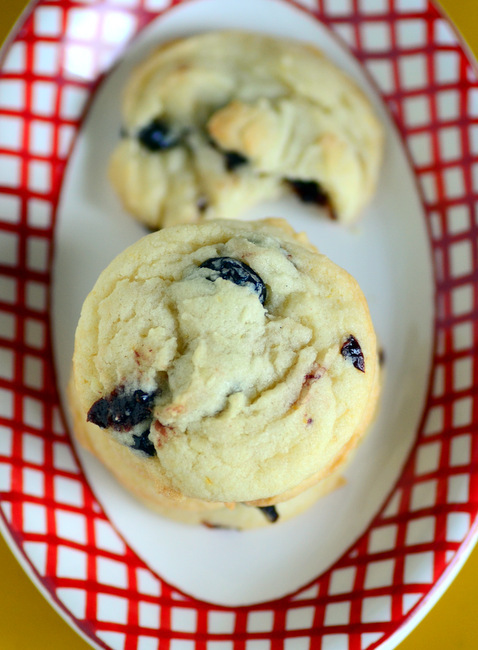 The dough is infused with lemon zest and generously studded with dried tart cherries. Tart cherries are the type that are often called for in baking pies, too. There are enough cherries that you should get at least one in every bite, but not so many that you can’t appreciate the chewy-on-the-inside and crisp-on-the-outside buttery sugar cookie dough that they’re packed in. You’ll typically see dried cherries available both sweetened and unsweetened. Both can be used here. Unsweetened cherries are a bit more tart, so you’ll end up with a cookie that is slightly less sweet overall if you opt for those. 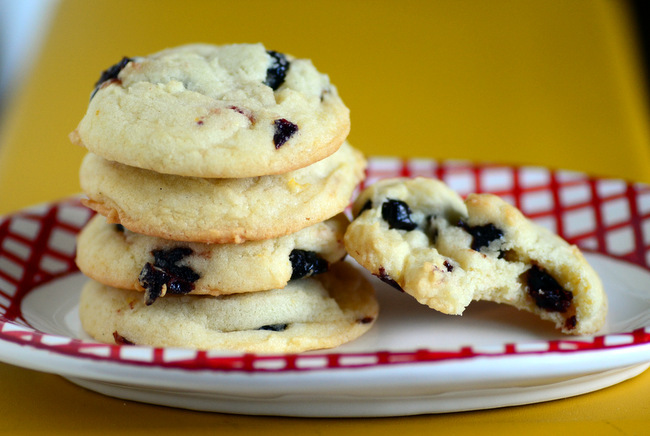 I personally prefer to use sweetened cherries in this case because the cookie dough isn’t overly sweet and I find the sweeter cherries contrast very well with the fresh lemon zest. Now, if you’re not in a hurry to bake your cookies and can take the time to refrigerate them for 24 hours before baking, I suggest that you do so. That refrigeration period actually makes for a chewier cookie in the end. The cookies will still taste great and have a chewy center when baked right away, the difference is that chewiness will actually last longer (nice if you’re not planning to eat the whole batch in a day or two) and the cookies will almost seem creamier when the dough has been chilled. In a large bowl, cream together the butter and the sugar, beating with an electric mixer until light. Beat in egg and lemon zest. With the mixer on low speed, gradually add in the flour mixture, stirring only until just combined. Stir in the cherries. Shape dough into 1-inch balls and arrange on prepared baking sheets. Bake for 10-12 minutes, until edges are set and have a hint of golden brown. Cool for 3-4 minutes on baking sheet then transfer to a wire rack to cool completely. Makes about 3 – 3 1/2 dozen. *Dough can be refrigerated for 24 hours prior to baking for slightly chewier cookies, if desired. Yum! I feel like strawberries get all the dessert love this time of year, so I’m so loving this! Especially when paired with the lemon. Can’t wait to try! YUM! These cookies look fabulous! I love how easy they are to make!